This entry was posted in Varieties. Doing fine, just not sure how it is I’m doing all that I am or how long I can last doing it! Miss you, too. I have ZERO luck with cole crops…but will keep trying! Thanks! This was the only seedling the bugs or the weather didn’t kill. I think next year I need to transplant into a larger pot at least once more so the wee ones have a fighting chance. (This is why there will be zero cauliflower pictures this year…) Do keep trying! It is so rewarding when years of trying results in success! 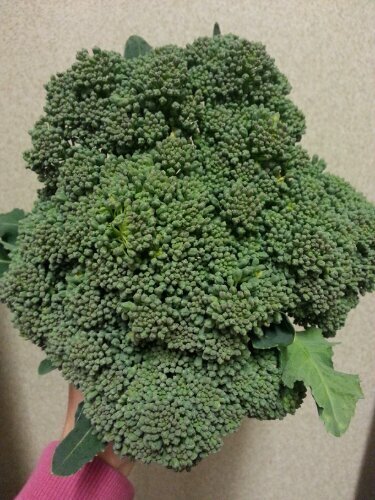 I didn’t realize broccoli produced in winter! Interesting. It does in what Texas calls “winter”. I’m not sure it would where you are. I couldn’t get it to produce in spring or summer here so figured I’d give it a winter shot.